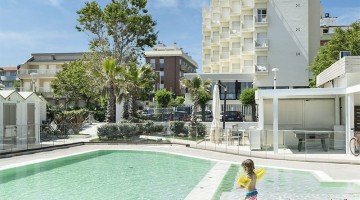 Hotel Admiral , 3 star superior hotel in Riccione, with direct access to the beach, offers refined rooms and numerous services including: private parking, garage, WI-FI throughout the entire hotel and on the beach, spacious rooms, garden and air conditioning. Pets Allowed. The hotel is located directly on the beach of Riccione, with direct access to the establishment from the hotel lobby, with no roads to cross. The center of Riccione can be reached by a half-hour walk. The rooms have a balcony overlooking the sea, air conditioning, private safe, minibar, telephone, satellite LCD TV and digital terrestrial, WI-FI connection, private bathroom with hairdryer. ROMANTIQUE: with double or twin bed, balcony with side sea view. They are also available in a single version with a French queen size bed. BELLEVUE: can be double, triple or quadruple, with balcony facing the sea. JUNIOR SUITE: very spacious, can accommodate up to 6 people, equipped with: two bathrooms with bath and shower and balcony facing the sea. Garden connected to the beach, bikes available, terrace, american bar, reading room with newspapers, laundry service on request. PARKING: the hotel has three different solutions: uncovered and fenced with direct access to the hotel, subject to charges; uncovered and fenced ten meters from the hotel, subject to charges; and finally an underground garage located two hundred meters from the hotel, subject to charges. WI-FI: throughout the entire hotel and also on the beach. CONVENTIONS: beach, law enforcement, shuttle service and organized excursions (both on request). BREAKFAST: sweet and savory, with buffet served in the garden. LUNCH AND DINNER: choice of menu with meat and fish dishes every day and homemade pasta. The kitchen proposes traditional Romagna dishes. In hotel: strollers, baby sitter service and pediatrician on request. In the room: cots, bottle warmer on request. At meals: high chairs, baby menu and baby food. On the beach: playground area, entertainment, mini club service with baby sitting. The hotel has an agreement with the 117 Alba d'Oro beach, which can be reached from the hotel's garden without having to cross the street. The establishment has: swimming pool with heated water, relaxation area with two hydromassages, games for children, area for animals and WI-FI connection. Still few rooms available for an Easter on the beach of Riccione! Choose your hotel directly by the sea and take advantage of the exclusive offer that the Hotel Admiral offers! Easter offer in Riccione full board with Easter lunch! Book now your Easter directly on the beach of Riccione in full board, starting from € 65.00 per person per day. Come and let yourself be pampered in the refined and relaxing rooms of the Hotel Admiral! The offer includes a delicious and cheerful Easter lunch, served in our panoramic restaurant. Special discounts for children in the room with 2 adults. Contact us to receive your exclusive and personalized quote. June directly on the sea in Riccione! Do not miss the opportunity to spend the beginning of summer directly on the beach of Riccione in complete tranquility and relaxation. Super advantageous offers in a double room with a balcony overlooking the sea and special discounts for children in the room with 2 adults. Minimum stay of 4 days in full board starting from € 65.00 per person per day. Spend a few relaxing days on the April 25th Bridge in a full comfort facility that stands directly on the Riccione Beach! Full board with a wide choice of fresh meat and fish menus every day, in our room with a panoramic view of the sea! Quiet rooms, all with balconies overlooking the sea and directly facing the sea. Contact us and we will send you the solution that best suits your needs!